Fitting out a new warehouse can be an overwhelming project with many tasks to think about. Clear and durable line marking is essential for a safe and efficient warehouse environment. It is, however, usually one of the most overlooked tasks. The larger elements such as automation and racking are always top of mind and naturally dominate planning. If you’re not careful, however, important tasks such as line marking, barcode labelling and signage are easily forgotten – even though they significantly improve the productivity and safety of a site. Whether it’s an ambient facility or a freezer/chilled warehouse, the need for effective line marking are similar. With a host of uses, line marking is essential for designating safety areas, walkways, locations or aisle numbers. Additionally, the benefits extend to outside the warehouse, as line marking is important for highlighting loading bays as well as car and lorry parks. Line marking significantly increases safety within a warehouse. A busy warehouse has high volumes of traffic – whether it’s fast moving trucks or more vulnerable, slower moving pedestrians. In order to help reduce accidents, line marking is essential for delineating safe walking zones or truck lanes. Without clear demarcation, there is always the potential for accidents. A durable line marking solution will withstand both truck and foot traffic to provide clear guidance for several years. Additionally, line marking can also be used to help workers navigate a facility more efficiently. Line marking paint can be used as a reliable solution for defining product locations on warehouse floors. In addition to this, line marking can also be used for highlighting loading bays and pallet locations. By ensuring locations are clearly marked, it removes any confusion. Workers instantly know where things should be and can concentrate on their duties. Not just for indoor use, line marking is also essential for outside areas of a warehouse. It is important for facilities to mark out any loading bay areas to assist with deliveries and despatch. In addition, line marking is crucial for providing direction and guidance in areas such as car parks – especially for larger warehouses which may have different parking zones. It can also be used for pedestrian walkways, disabled signs, speed limits, restriction zones and company logos. The Total Rapidshield™ line marking system uses specialist polyurethane coatings which are cured instantly using high powered ultraviolet (UV) light. The coatings are applied to a pre-prepared floor, in four layers (primer, two colour coats and top coat). Each layer is baked onto the floor, leaving a hardened surface which offers outstanding durability and visible markings that are easy to maintain. These lines can last up to five years under normal site conditions. The Duraline RapidshieldTM system uses a conventional line marking paint which dries in four hours. Although not as durable as the Duraline Epoxy paint on its own – the Duraline Rapid System gains its durability from a Rapidshield™ clear UV coating. This is applied on top of the colour coat and cured instantly using high powered ultraviolet light. This forms an extremely hard durable surface giving an expected lifespan of up to four years under heavy traffic conditions. This system also has the added advantage of reduced downtime – areas can be finished and ready for use within an eight hour shift. Duraline line marking is a 2 Pack Epoxy Paint formulation applied using an airless spray machine. Inotec can pre-prepare the surface with either shot blast or diamond polishing, which gives a perfect ‘key’ for the paint and makes the bond to the floor extremely strong. The paint system is then applied in two coats. This system can be used for both internal and external yard markings. Full curing for heavy traffic will take 24 hours at 10°C. This process makes Duraline much more durable than conventional line marking paints; it offers a minimum of two years use even in heavy traffic conditions – minimising costly remarking and touch-up regimes. 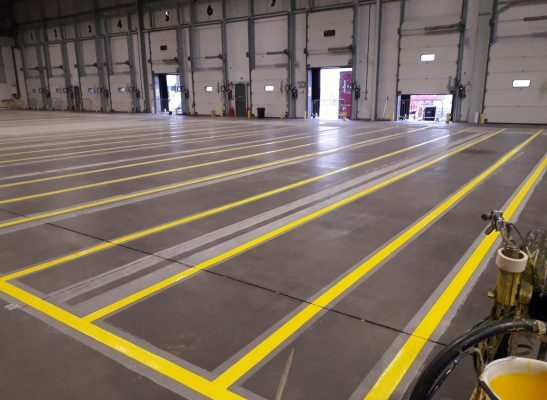 If you would like to install line marking within your current or new warehouse facility and you’re not sure what you need, contact inotec UK on 01482 654466 or email info@inotec.co.uk for a consultation with the sales team.